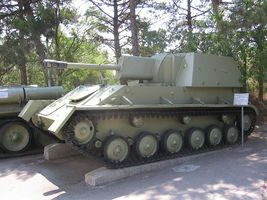 The SU-76M is a Soviet tier 3 tank destroyer. 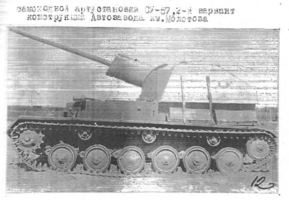 Light vehicle with a 76-mm gun, the most widely produced Soviet SPG. 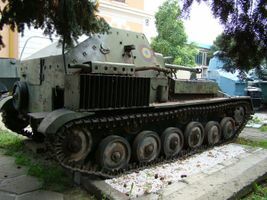 Despite its weak armor and armament, the vehicle was used to support infantry and cavalry. The SU-76M is the first Russian tank destroyer that combines high penetration, accuracy and view range with a reasonable damage output. 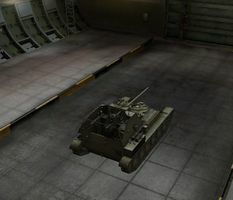 Thereby it can be called the first real sniper that a player can reach in World of Tanks. Additionally, it has exceptional camouflage values, allowing it to fire from a covered position and remain hidden from all but the closest enemies. This is very helpful, as the SU-76M has very thin armor and will not survive concentrated enemy fire. 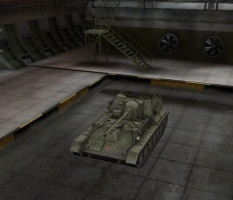 The SU-76M leads to the SU-85B. Note that a lot of the pros have the caveat of "once fully upgraded". This is because the stock SU-76M is an absolutely atrocious tank. It cannot mount anything without upgrading the suspension first, not even a Camouflage Net or Binocular Telescope. The rather poor stock engine exacerbates your lack of armor. Upgrading to the M-80 is an excellent first choice, since the cost is very cheap and the engine does not weigh any more than the stock one.. Once the M-80 engine is mounted, the SU-76M becomes quite mobile, although it can have trouble climbing slopes. 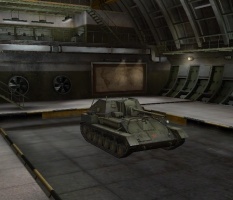 The SU-76M's strength lies in long range combat, where it can easily kill any opponent it encounters. 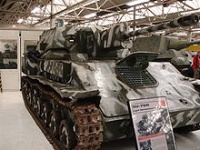 At the same time, it has nearly no defense against fast moving enemies that can close the distance, and there are many fast tanks in the lower tiers. If it wishes to survive, the SU-76M should always stay behind the frontlines and support other tanks. Ideally, the SU-76M does well from spots overlooking large open areas, as in Malinovka, but really suffers in city maps like Ensk, Ruinberg, and Himmelsdorf, where it must play very cautiously. Once Camouflage and Sixth Sense have been trained, more specialized skills may be considered: Recon (Commander), Snap Shot (Gunner), Smooth Ride (Driver), Situational Awareness (Loader/Radio Operator). Recon and Situational Awareness provide a useful 5% combined bonus to the SU-76's already good view range. 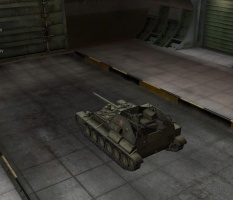 Snap Shot and Smooth Ride allow the SU-76 to aim faster in order to get an accurate shot off faster, although Off-Road Driving can also be useful to help augment the SU-76's good mobility. Brothers-in-Arms is a good perk to have on any tank, but requires all crew members to have it at 100% before it works. The bonus to crew skills is particularly noticeable when combined with Improved Ventilation. It should be saved for later on the SU-76M, at least until after Camouflage and Sixth Sense have been fully trained. Researching the 9RM radio is highly recommended because it carries over as the top radio all the way up to the SU-100. SU-76 at National Military Museum 'King Ferdinand I'. Bucharest, Romania. 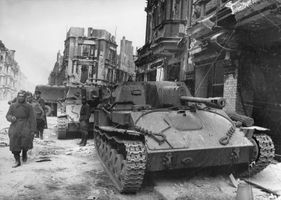 SU-76 on the road of Berlin. 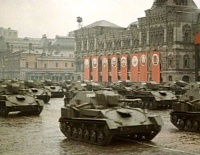 May 1945. This page was last modified on 20 January 2017, at 09:11. This page has been accessed 194,189 times.